In a couple of hours, an install guy is coming to site A53 at Lone Wolf RV Park. 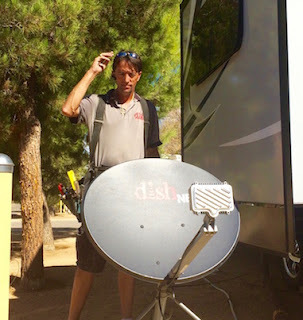 We have subscribed to Dish Satellite Internet. The install guy will place the dish and hook us up. We have been using Little iPhone's Personal HotSpot to gain internet access. And our AT&T billing has been going been going "USE" crazy! We suspect, that a neighbor here at Lone Wolf was able to hack into that HotSpot. That's part of the reason for the Dish Network installation this morning. The main reason is that with Dish, we get 50Gb/month high speed internet access. And, when we move to Jojoba Hills Escapee Resort, we will be able to use our Dish Antenna there too! This morning we switched from Personal HotSpot thru WiFi, to Personal HotSpot thru USB. We hope that this change, causes some grief to our neighbor who has been "borrowing" our internet access connection!! Our Action List is getting mighty small! Everything around Miss Twayler is getting sooooo squared away. Very likely, we never would have gone to Dish Satellite Internet, if that neighbor/crook had not stole so much of our AT&T data. But, now that we have Dish, and all that goes with it, we are sooooo happy we are here! I wanted to buy the New Apple TV with the new remote. These products are extremely easy to find on the net. And easy to buy also. However, I could not find them on the net!! I tried phoning Best Buy. Nobody answered the phone. Tried an Apple Store. Nobody answered that phone either! Then..... I stopped. And realized that, for whatever reason, my Guardian Angel did not want me to buy this Apple Stuff today. That's why I was getting all of these challenges! Friends of ours who have a lot at Jojoba told us that they have wifi at Jojoba for $35 a month and they are able to stream movies and TV programs using that. When I rented at Jojoba, I used Jabba Communications. The WiFi company that you are writing about. I tried Jabba and did not care for it. ARGH! those wifi pirates can really rack up a bill!!! If I had known about using a USB connection inset∂ of WiFi, I may have thwarted that dirty data thief! Glad you are getting Scampy! And yes, you will have to be very careful driving, but don't let anyone tell you that you are too old to do this. Just take it easy and relearn to drive. Also, make your first trips out short so you won't get frustrated with having to be somewhere before dark. I enjoy receiving your very good advice! Good thinking Grandma! What's the saying "you don't plan to fail...you fail to plan". Scampy will be here soon! On the 24th of October.